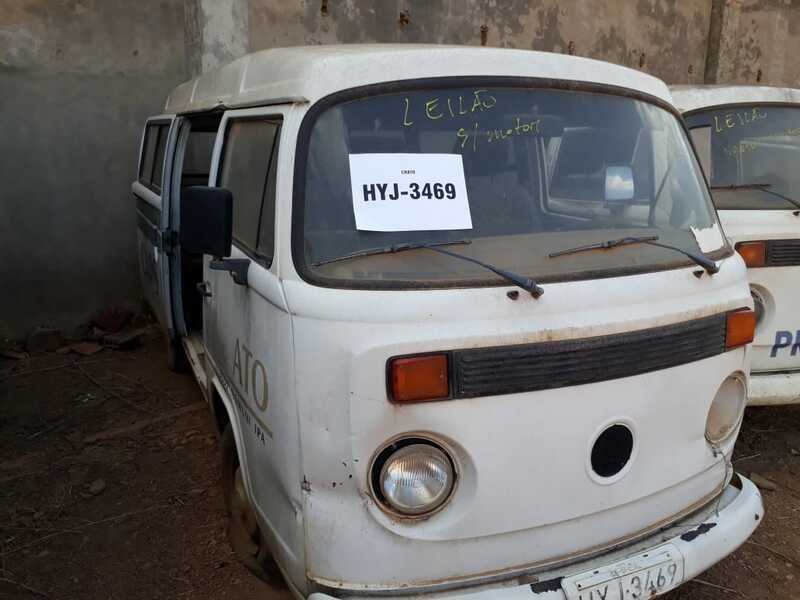 ÔNIBUS MERCEDES/MARCOPOLO, ÔNIBUS VW MARCOPOLO FRATELO, ÔNIBUS IVECO CITYCLASS , CAMINHÃO CHEVROLET 14000, TOYOTA COROLLA, DOBLÔS, KOMBIS, FIAT UNO MILLE FIRE, VW GOL, FIAT FIORINO, MOTOS YAMAHA YBR, HONDA TITAN. 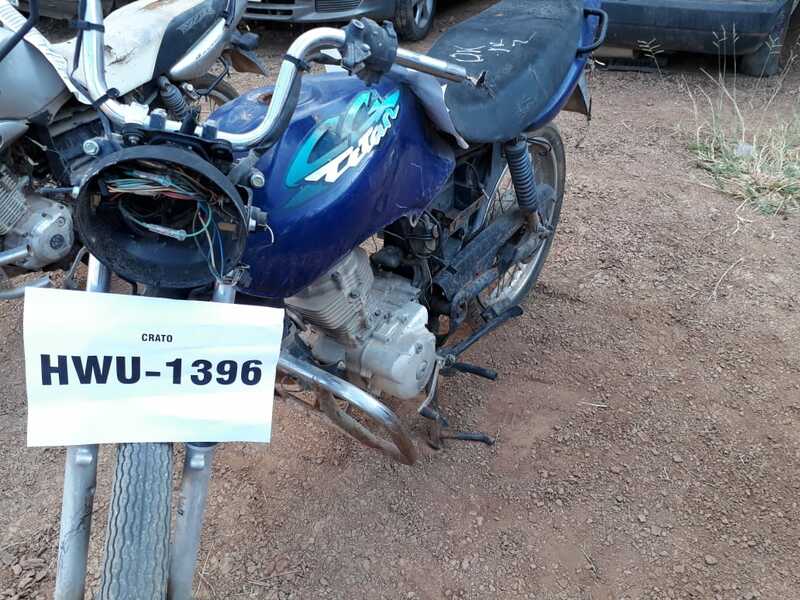 01 tipo: MOTOCICLETA – MARCA: - HONDACG125 TITAN KS - PLACAS:- HWU1396CE - COMB. :- G- COR:-AZ - ANO FAB. :-2002 - ANO MOD. 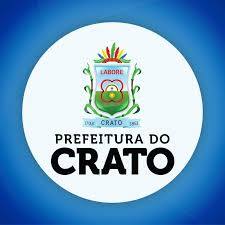 :- 2002- CHASSI N.º: 9C2JC30102R223058 - MOTOR N.º JC30E12223058 - RENAVAM:- 788848836 . 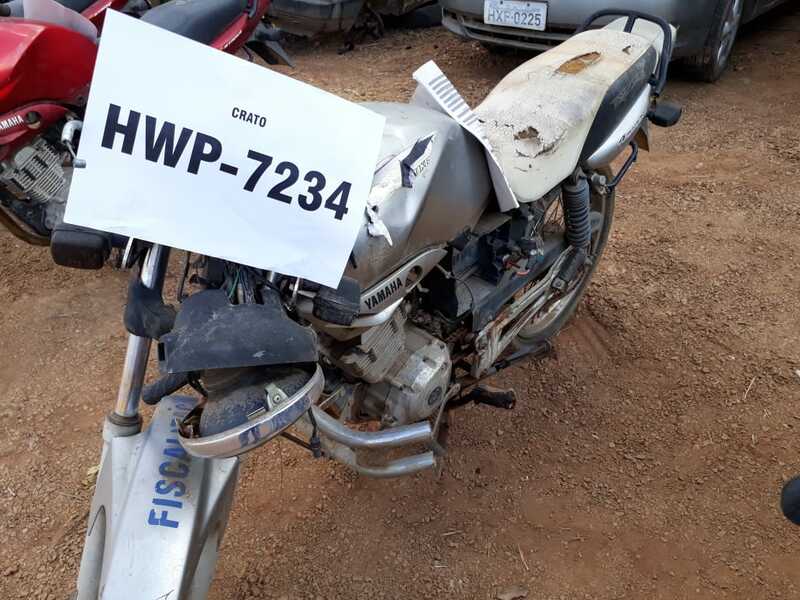 01 tipo: MOTOCICLETA – MARCA: - YAMAHAYBR125 K - PLACAS:- HWJ2904CE - COMB. :- G- COR:-VM - ANO FAB. :-2005 - ANO MOD. 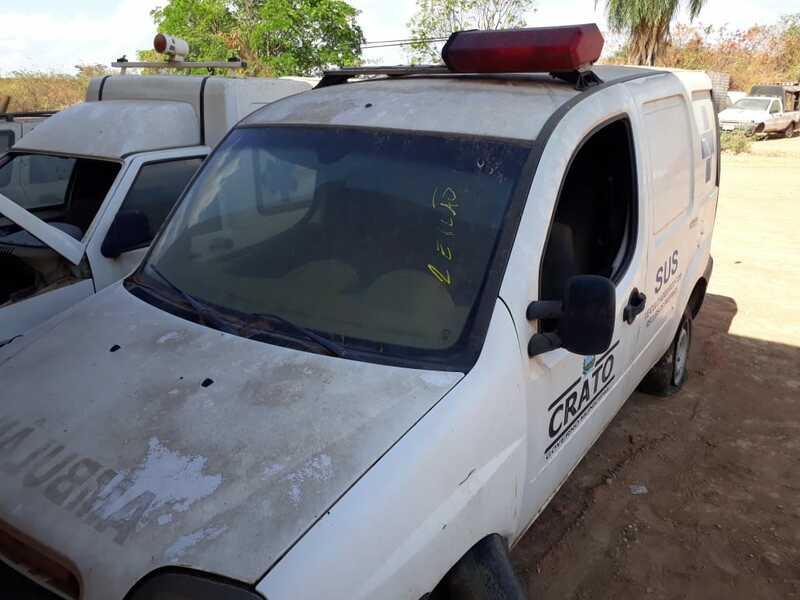 :- 2005- CHASSI N.º: 9C6KE044050113016 - MOTOR N.º E338E-110203 - RENAVAM:- 856409812 . 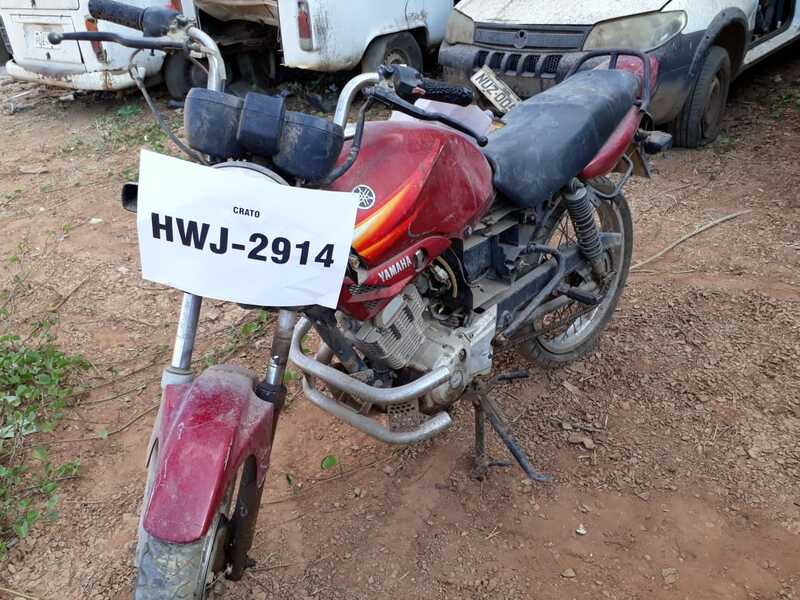 01 tipo: MOTOCICLETA – MARCA: - YAMAHAYBR125 K - PLACAS:- HWJ2914CE - COMB. :- G- COR:-VM - ANO FAB. :-2005 - ANO MOD. 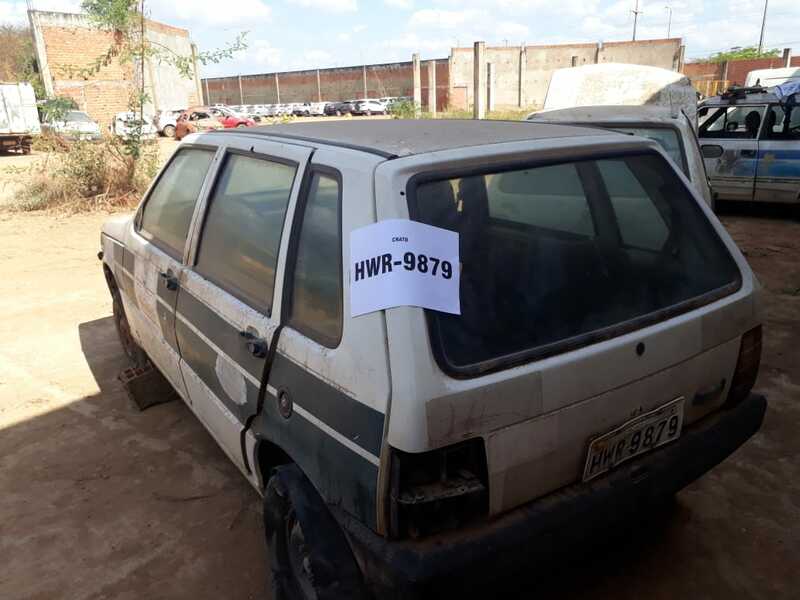 :- 2005- CHASSI N.º: 9C6KE044050113149 - MOTOR N.º E338E-110307 - RENAVAM:- 856410896. 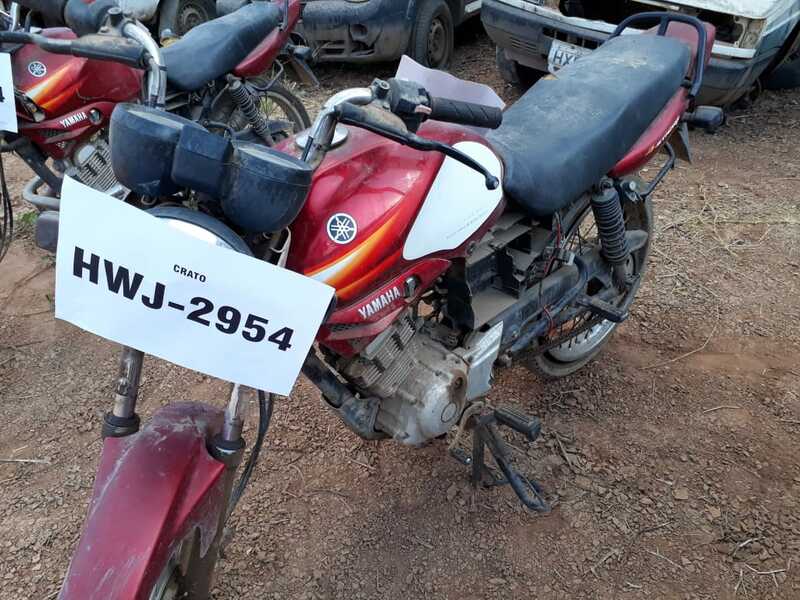 01 tipo: MOTOCICLETA – MARCA: - YAMAHAYBR125 K - PLACAS:- HWJ2954CE - COMB. :- G- COR:-VM - ANO FAB. :-2005 - ANO MOD. :- 2005- CHASSI N.º: 9C6KE044050113030 - MOTOR N.º E338E-110189 - RENAVAM:- 857170554. 01 tipo: MOTOCICLETA -MARCA: -YAMAHAYBR125 K - PLACAS:-HWJ4374CE -COMB. :-G-COR:-VM -ANO FAB. :-2005 - ANO MOD. :-2005-CHASSI N.º: 9C6KE044050109352 -MOTOR N.º E338E-108005 -RENAVAM:-855980044. 01 tipo: MOTOCICLETA - MARCA: -YAMAHAYBR 125E - PLACAS:-HWP7234CE - COMB. :-G-COR:-PT -ANO FAB. :-2005 - ANO MOD. :-2006-CHASSI N.º: 9C6KE091060004095 -MOTOR N.º E381E-005708 -RENA V AM:-885385683. 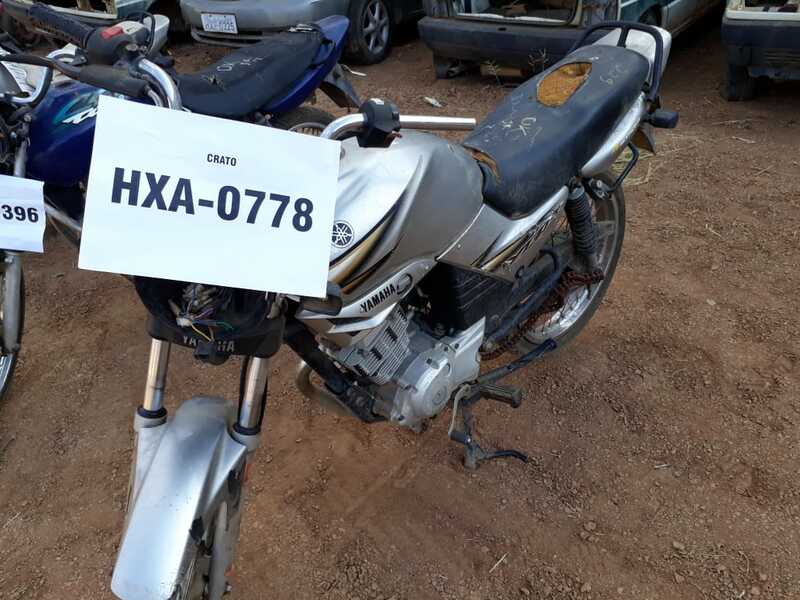 01 tipo: MOTOCICLETA -MARCA:-YAMAHA YBR125 K - PLACAS:-HXA0778CE -COMB. :-G-COR:-PT -ANO FAB. :-2005 - ANO MOD. 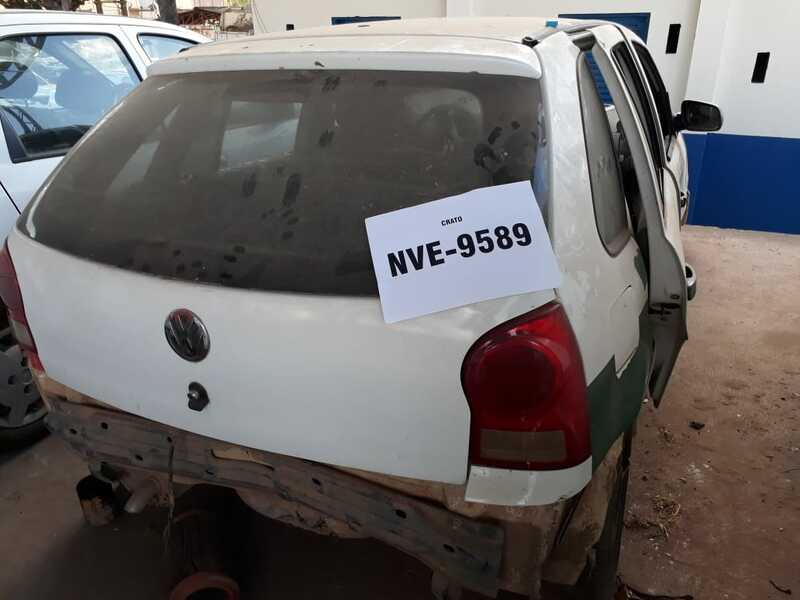 :-2005-CHASSI N.º: 9C6KE044050119735 -MOTOR N.º E338E-116570 -RENAVAM:-866255664. 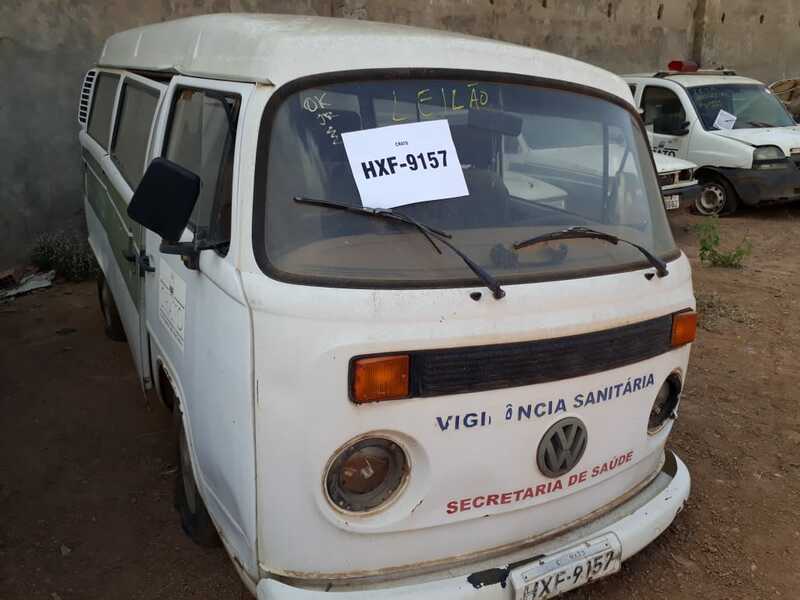 01 tipo: AUTOMOVEL - MARCA: - VWGOL 1.0 GIV - PLACAS:- NVE9589CE -COMB. :-GA-COR:-BC -ANO FAB. :-2011 -ANO MOD. :-2011-CHASSI N.º: 9BWAA05W6BP067054 -MOTOR N.0 CCP243360 -RENAVAM:-280665407. 01 tipo: CAMIONETE - MARCA: - FIAT FIORINO TECFORM ABI - PLACAS:-OIB7745CE -COMB. :-GA-COR:-BC -ANO FAB. :-2011 - ANO MOD. 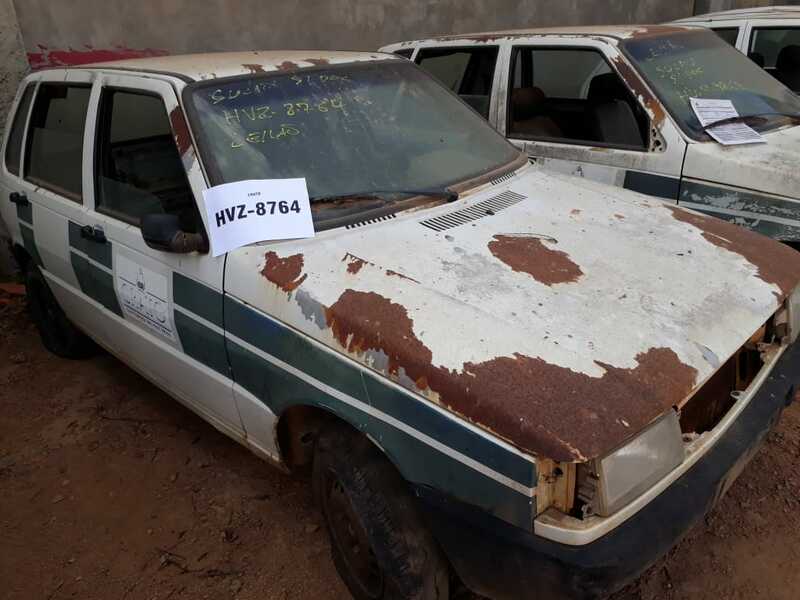 :-2012-CHASSI N.º: 9BD255049C8935932 -MOTOR N.º 178E90110687283 -RENAVAM:-470959215. 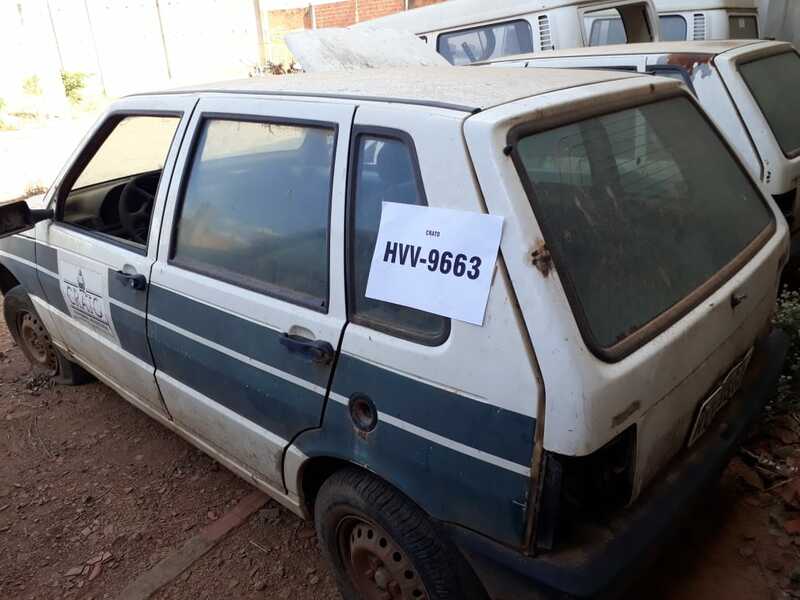 01 tipo: AUTOMOVEL -MARCA: - FIAT UNO MILLE EX - PLACAS:-HVF8357CE -COMB. :-G-COR:-BC -ANO FAB. :-1998 - ANO MOD. :-1999-CHASSI N.º: 9BD158018W4012464 - MOTOR N.º 5575237 - RENAVAM:-709099932 . 01 tipo: AUTOMOVEL - MARCA: - FIAT UNO MILLE EX - PLACAS:- HVW1315CE - COMB. :- G- COR:-BC - ANO FAB. :-1999 - ANO MOD. 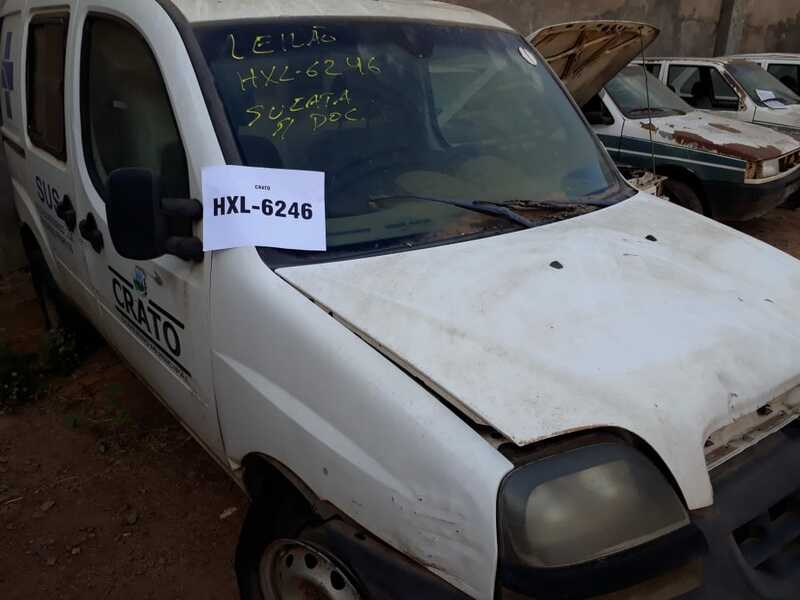 :- 1999- CHASSI N.º: 9BD158068X4066056 - MOTOR N 5750794 - RENAVAM:- 724957626 . 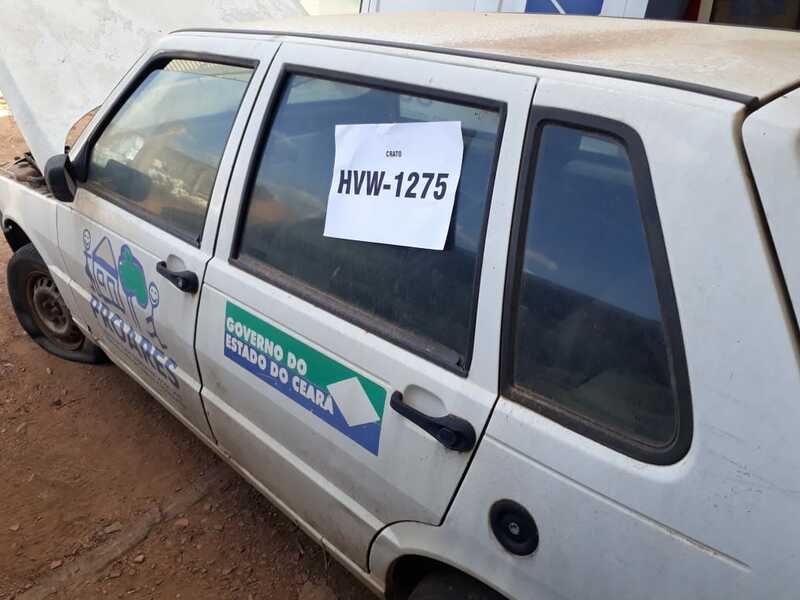 01 tipo: AUTOMOVEL - MARCA: - FIAT UNO MILLE EX - PLACAS:- HVW1295CE - COMB. :- G- COR:-BC - ANO FAB. :-1999 - ANO MOD. 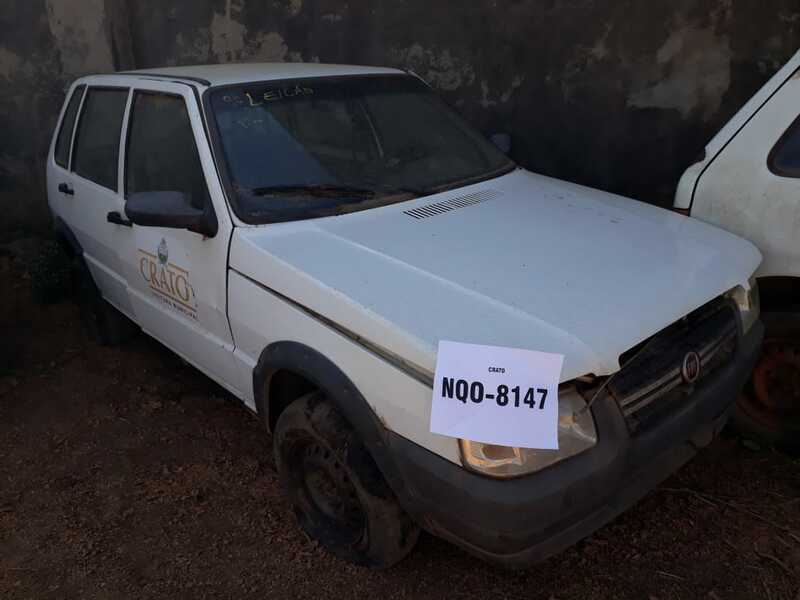 :- 1999- CHASSI N.º: 9BD158068X4065325 - MOTOR N.º 5750716 - RENAVAM:- 724957715. 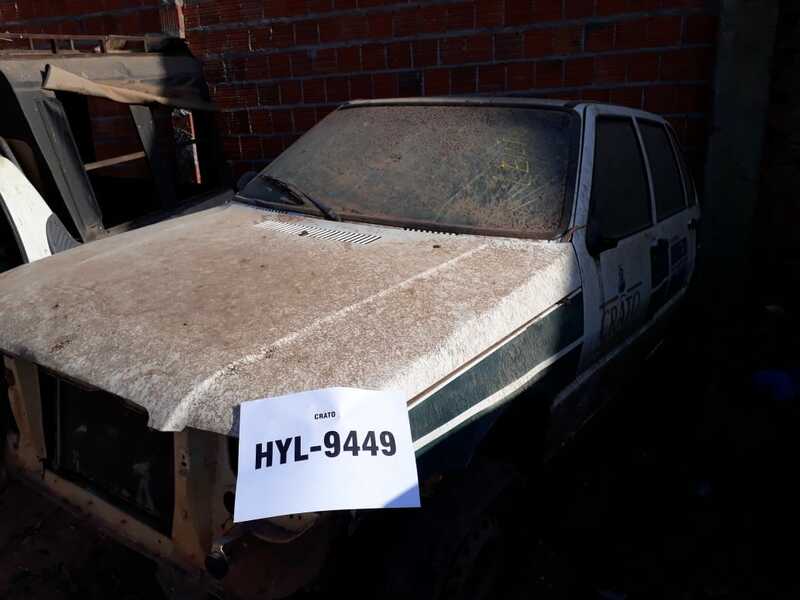 01 tipo: AUTOMOVEL -MARCA: - FIAT UNO MILLE FIRE FLEX - PLACAS:- HYL9439CE - COMB. :- GA- COR:-BC - ANO FAB. :-2005 - ANO MOD. :- 2006- CHASSI N.º: 9BD15822764770605 - MOTOR N.º 146E1011 *6618673* - RENAVAM:- 870242466 . 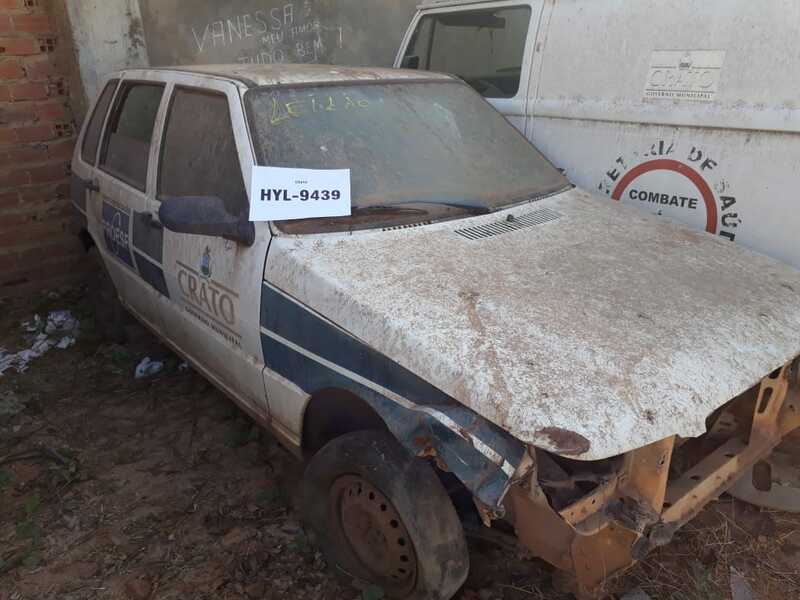 01 tipo: AUTOMOVEL - MARCA: - FIAT UNO MILLE FIRE FLEX - PLACAS:- HYL9449CE - COMB. :- GA- COR:-BC - ANO FAB. :-2005 - ANO MOD. :- 2006- CHASSI N.º: 9BD15822764770607 - MOTOR N.º 146El011 *6618690 - RENAVAM:- 870241540 . 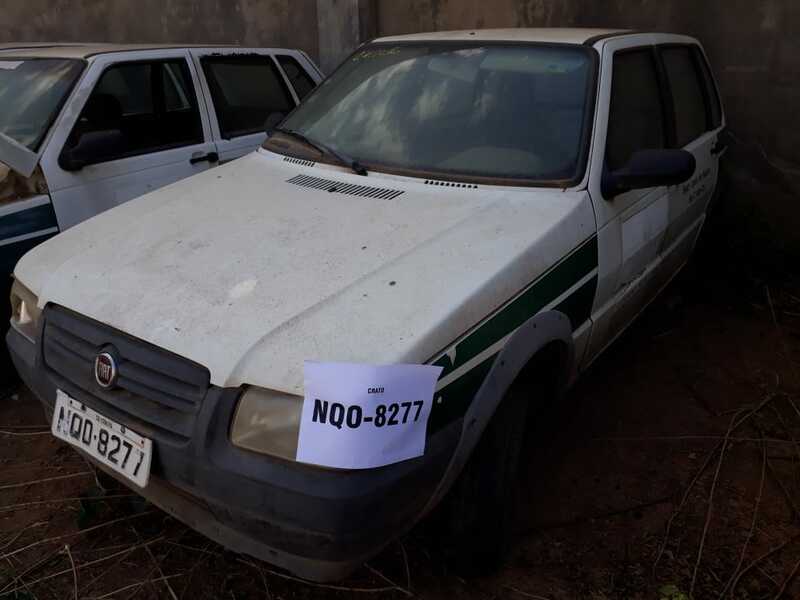 01 tipo: AUTOMOVEL – MARCA: - FIAT UNO MILLE FIRE - PLACAS:- HXB5966CE - COMB. :- G- COR:-BC - ANO FAB. :-2002 - ANO MOD. 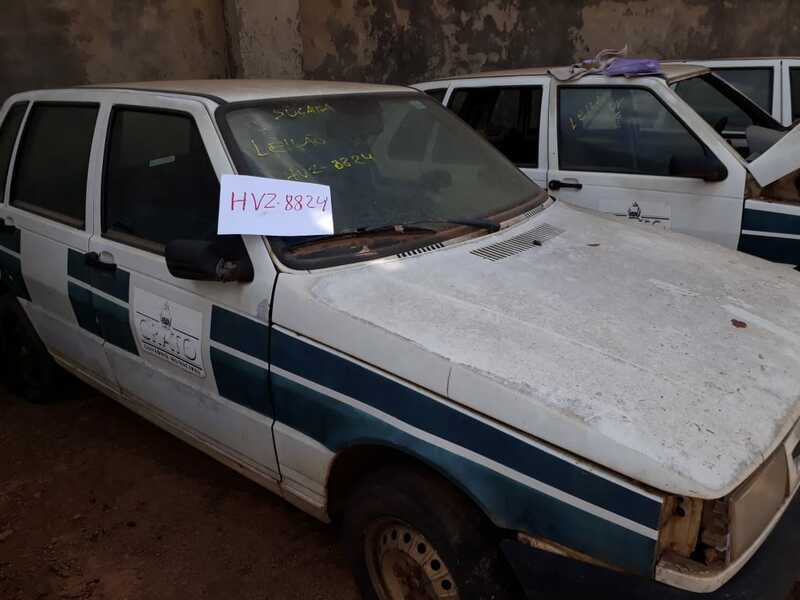 :- 2003- CHASSI N.º: 9BD15822534411671 - MOTOR N.º 5495162 - RENAVAM:- 809055660. 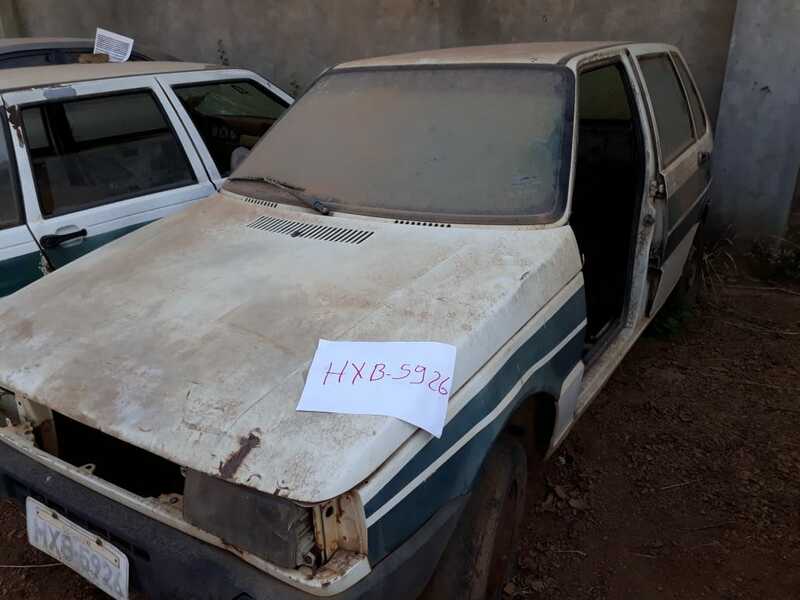 01 tipo: AUTOMOVEL – MARCA: - FIAT UNO MILLE FIRE - PLACAS:- HXB5986CE - COMB. :- G- COR:-BC - ANO FAB. :-2003 - ANO MOD. :- 2003- CHASSI N.º: 9BD15822534467676 - MOTOR N.º 178D9011*5688669 - RENAVAM:- 809055074. 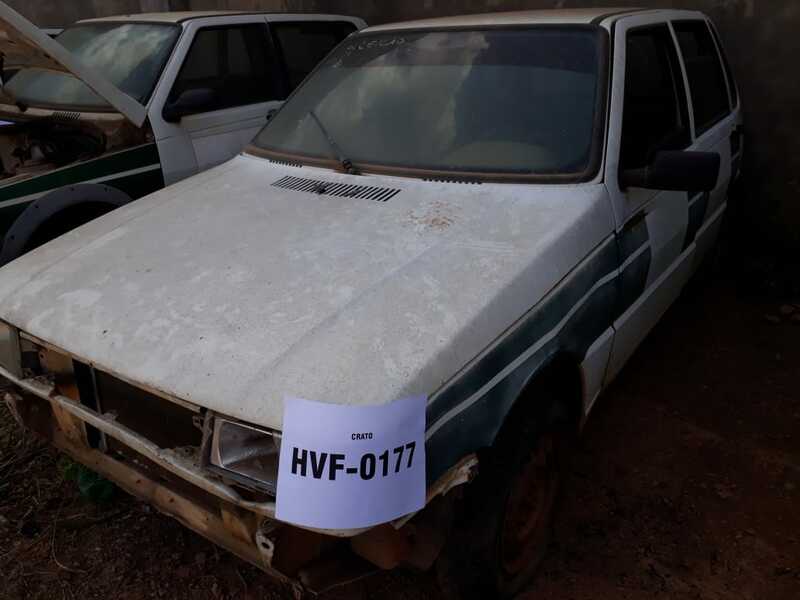 01 tipo: AUTOMOVEL -MARCA: -FIAT UNO MILLE FIRE -PLACAS:-HXF8957CE -COMB. :-G-COR:-BC -ANO FAB. :-2003 -ANO MOD. 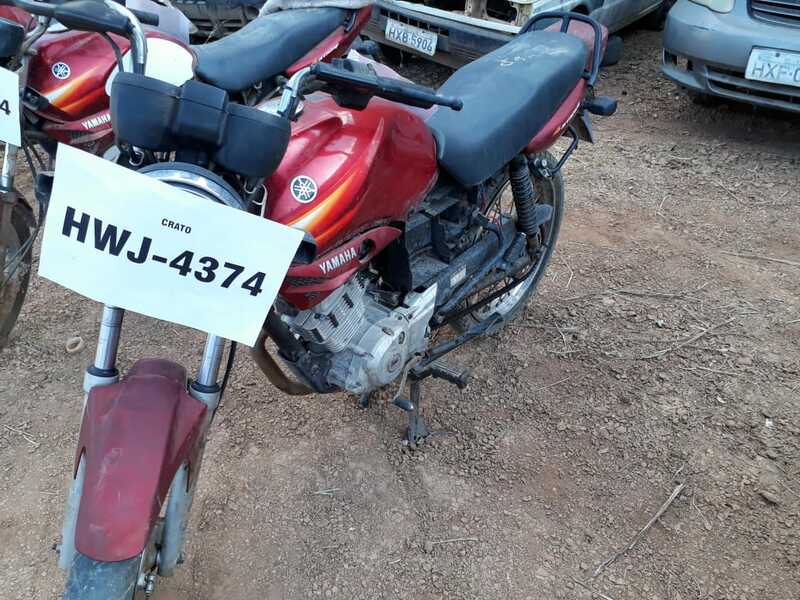 :-2003-CHASSI N.º: 9BD15822534474755 -MOTOR N.º 178D9011 *5713631 -RENAVAM:-810097737 . 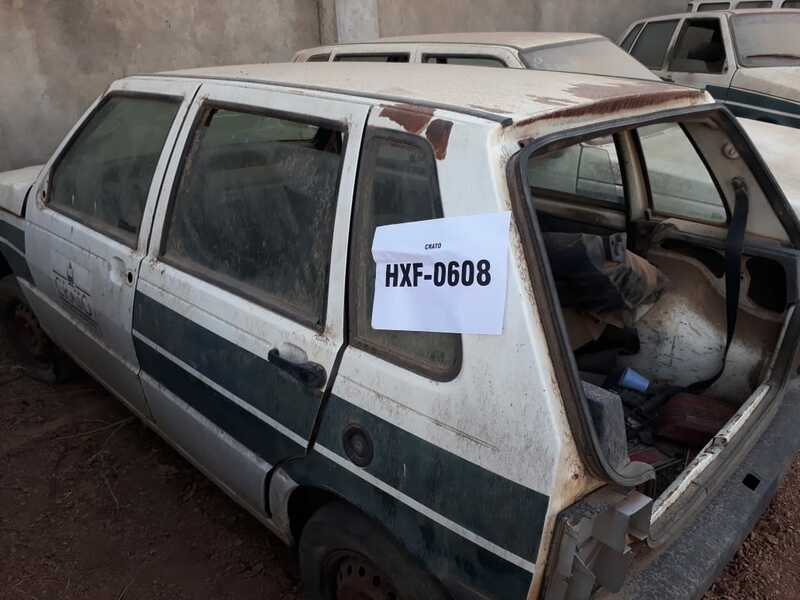 01 tipo: AUTOMOVEL - MARCA: - FIAT UNO MILLE FIRE - PLACAS:-HXF0608CE -COMB. :-G-COR:-BC -ANO FAB. :-2001 - ANO MOD. :-2002-CHASSI N.º: 9BD15822524303292 -MOTOR N.º 5231129 -RENAVAM:-766595064 . 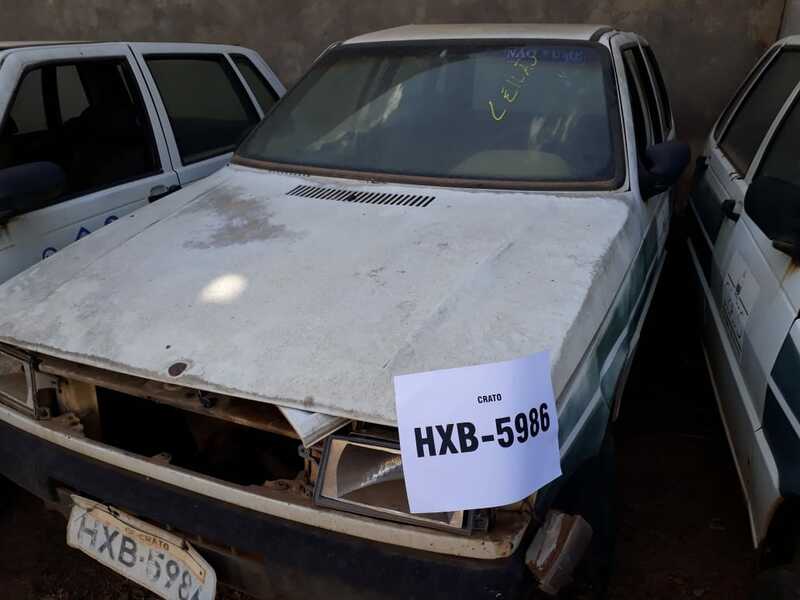 01 tipo: AUTOMOVEL - MARCA: - FIAT UNO MILLE FIRE - PLACAS:-HXB5946CE -COMB. :-G-COR:-BC -ANO FAB. :-2003 ANO MOD. :-2003-CHASSI N.º: 9BD15822534470961 -MOTOR N.º 178D9011 *5700854 -RENAVAM:-809053578. 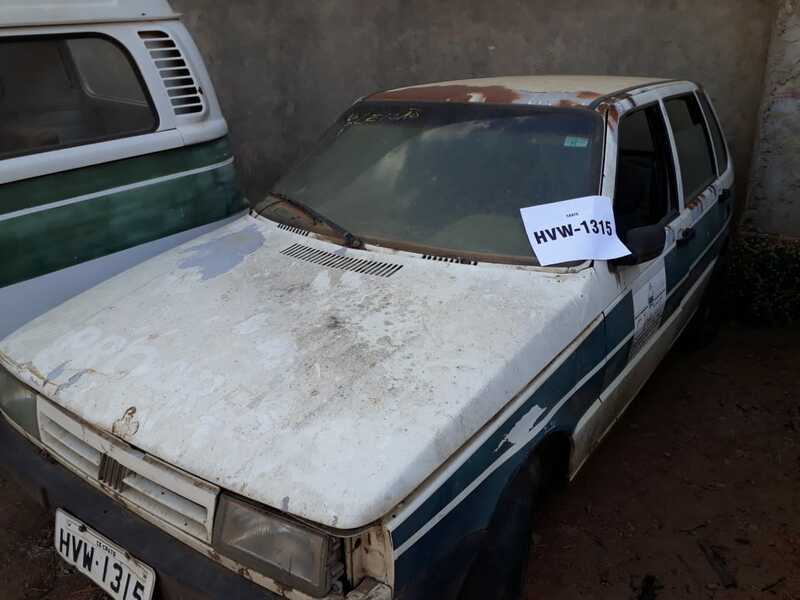 01 tipo: AUTOMOVEL -MARCA: -FIAT UNO MILLE FIRE - PLACAS:-HXB5926CE -COMB. :-G-COR:-BC -ANO FAB. :-2003 -ANO MOD. 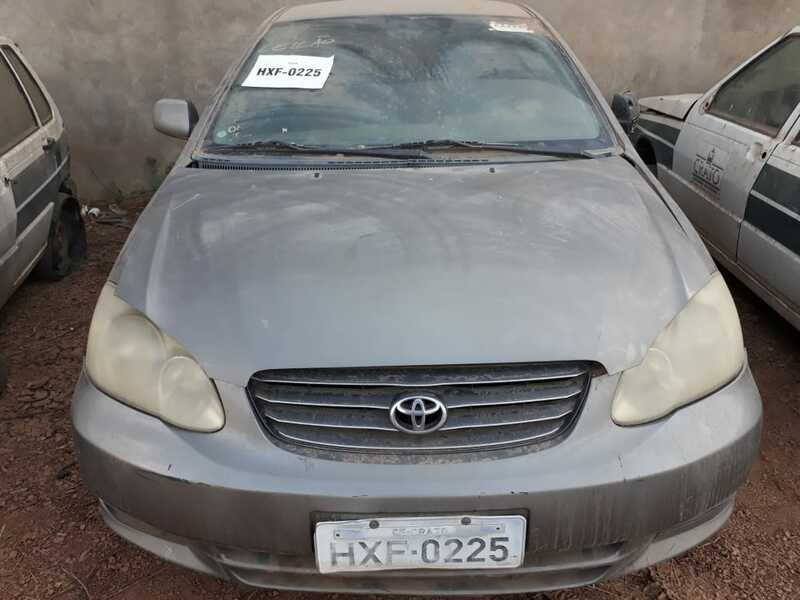 :-2003-CHASSI N.º: 9BD15822534490276 -MOTOR N.º 178D9011*5762520 -RENAVAM:-809054833 (SUCATA S/ DOCUMENTO) . 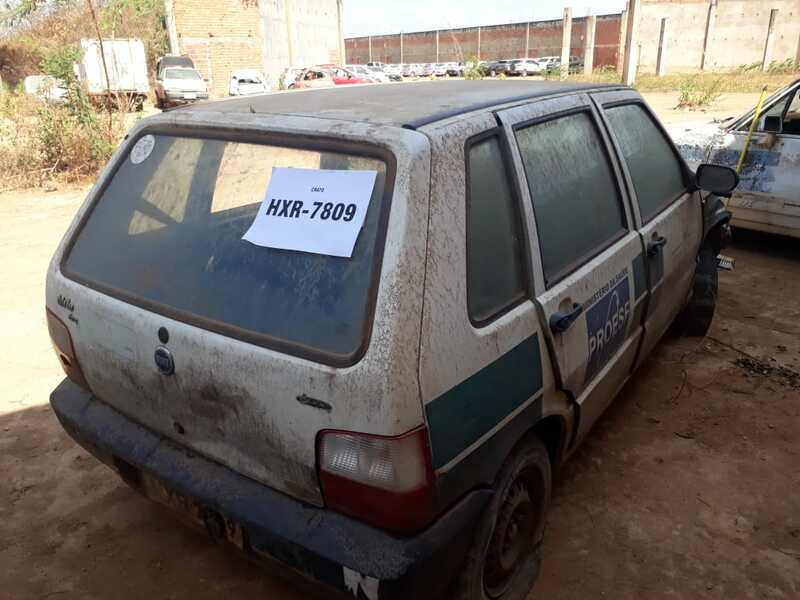 01 tipo: AUTOMOVEL – MARCA: - FIAT UNO MILLE FIRE - PLACAS:- HXB5906CE - COMB. :- G- COR:-BC - ANO FAB. :-2002 - ANO MOD. 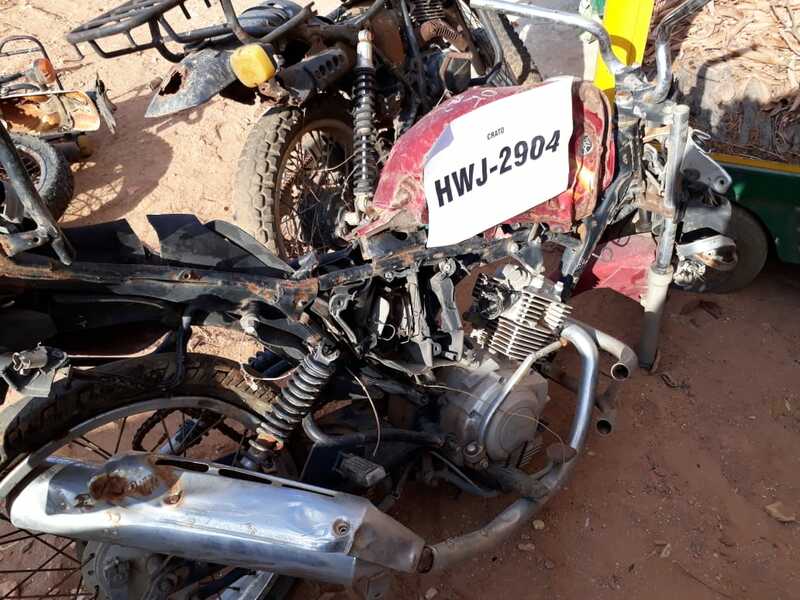 :- 2003- CHASSI N.º: 9BD15822534441748 - MOTOR N.º 178D9011*5605740 - RENAVAM:- 809054280 . 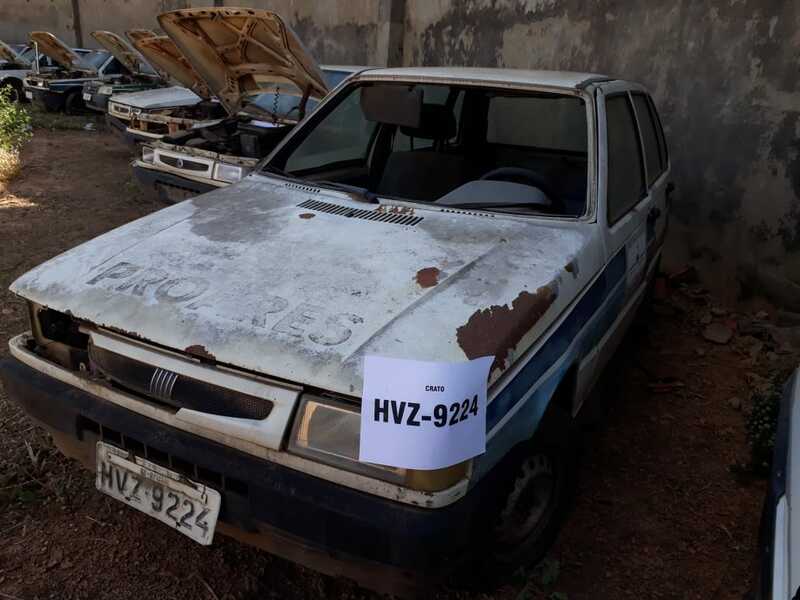 01 tipo: AUTOMOVEL – MARCA: - FIAT UNO MILLE SMART - PLACAS:- HVZ9224CE - COMB. :- G- COR:-BC - ANO FAB. :-2001 - ANO MOD. :- 2001- CHASSI N.º: 9BD15828814256847 - MOTOR N.º 6253461 - RENAVAM:- 760580952 . 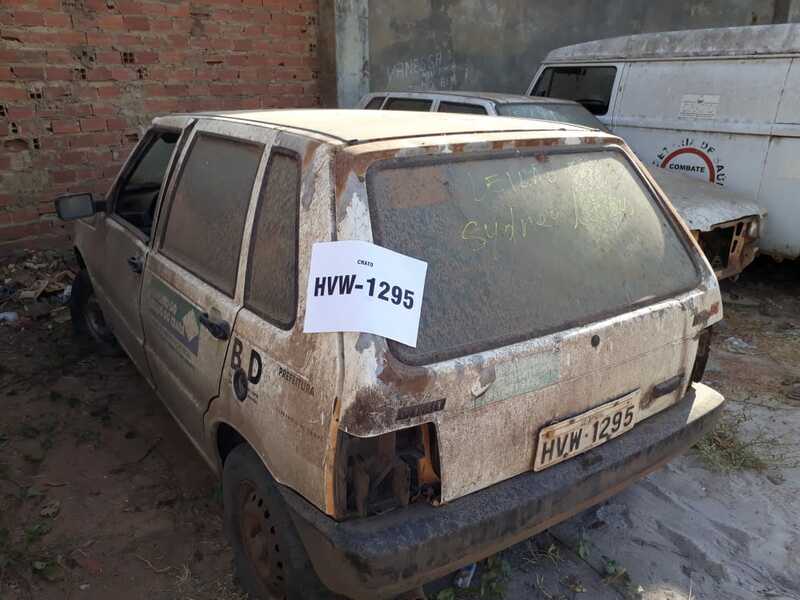 01 tipo: AUTOMOVEL -MARCA: -FIAT UNO MILLE SMART -PLACAS:-HVZ8854CE -COMB. :-G-COR:-BC -ANO FAB. :-2001 -ANO MOD. :-2001-CHASSI N.º: 9BD15828814258984 -MOTOR N.º 6256734 -RENAVAM:-760701881. 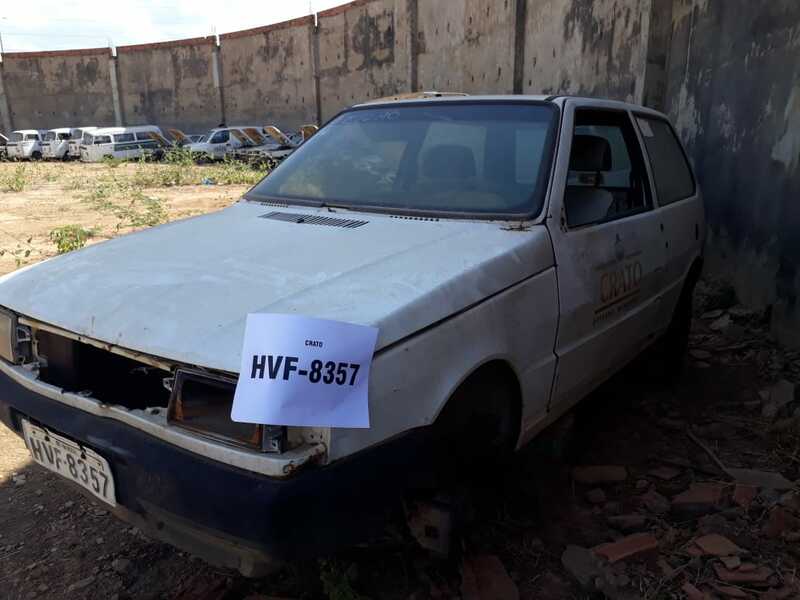 01 tipo: AUTOMOVEL - MARCA: - FIAT UNO MILLE SX - PLACAS:-HVF0177CE -COMB. :-G-COR:-BC -ANO FAB. :-1997 -ANO MOD. 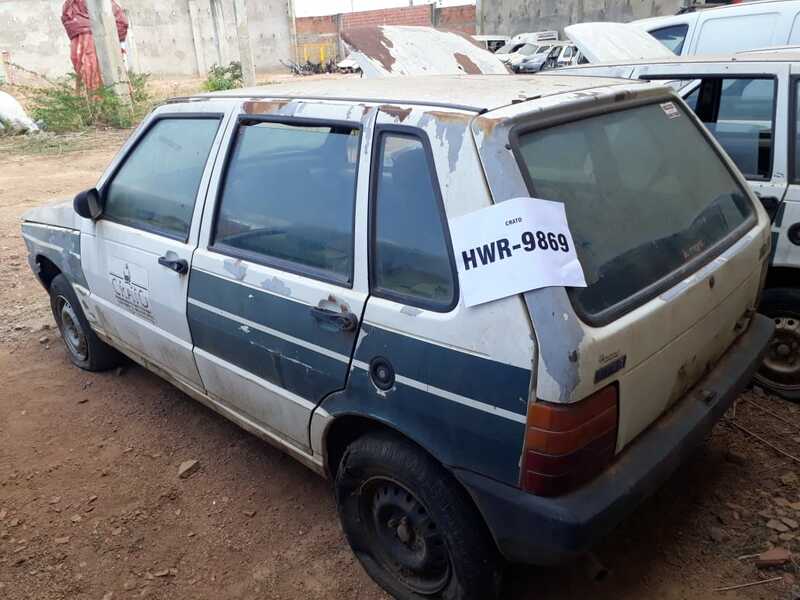 :-1997-CHASSI N.º: 9BD146048V5927577 -MOTOR N.º 5092465 -RENAVAM:-681676744. 01 tipo: AUTOMOVEL- MARCA: - FIAT UNO MILLE WAY ECON. 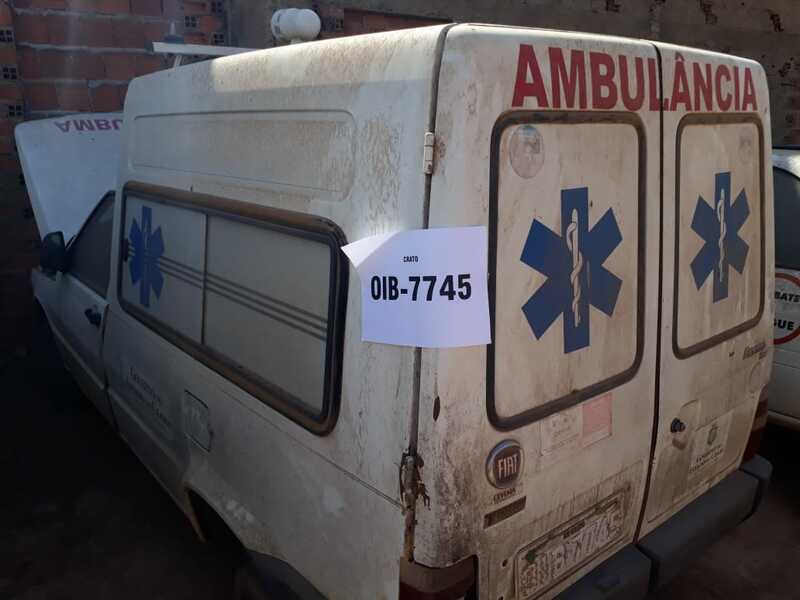 - PLACAS:- NQO8147CE - COMB. :- GA- COR:-BC - ANO FAB. :-2009 - ANO MOO. :- 2010- CHASSI N.º: 9BD15844AA6328005 - MOTOR N.º 146E1011 *8975252 - RENAVAM:- 155980700. 01 tipo: AUTOMOVEL- MARCA: - FIAT UNO MILLE WAY ECON. 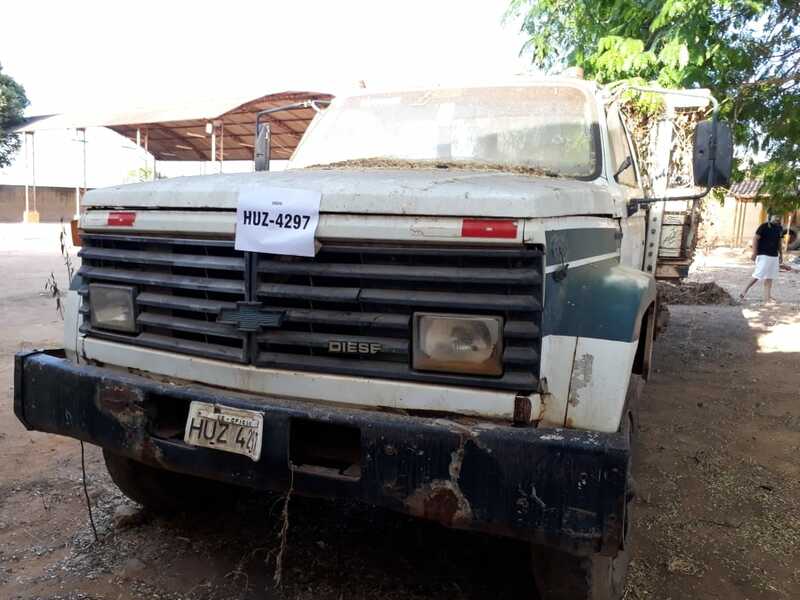 - PLACAS:- NQO8277CE - COMB. :- GA- COR:-BC - ANO FAB. :-2009 - ANO MOD. :- 2010- CHASSI N.º: 9BD15844AA6327994 - MOTOR N.º 146El011 *8975212 - RENAVAM:- 155980025 . 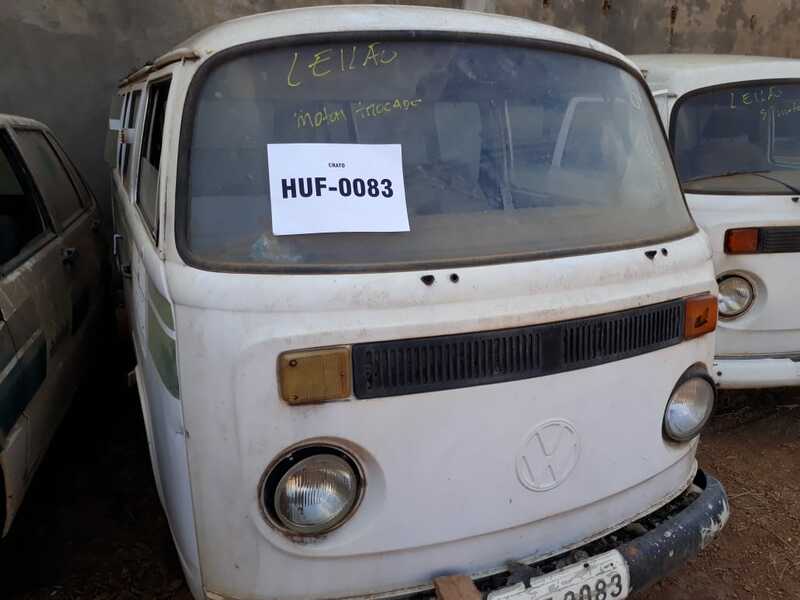 01 tipo: CAMIONETE – MARCA: - VWKOMBI - PLACAS:- HUF0083CE - COMB. :- G- COR:-BC - ANO FAB. :-1994 - ANO MOD. 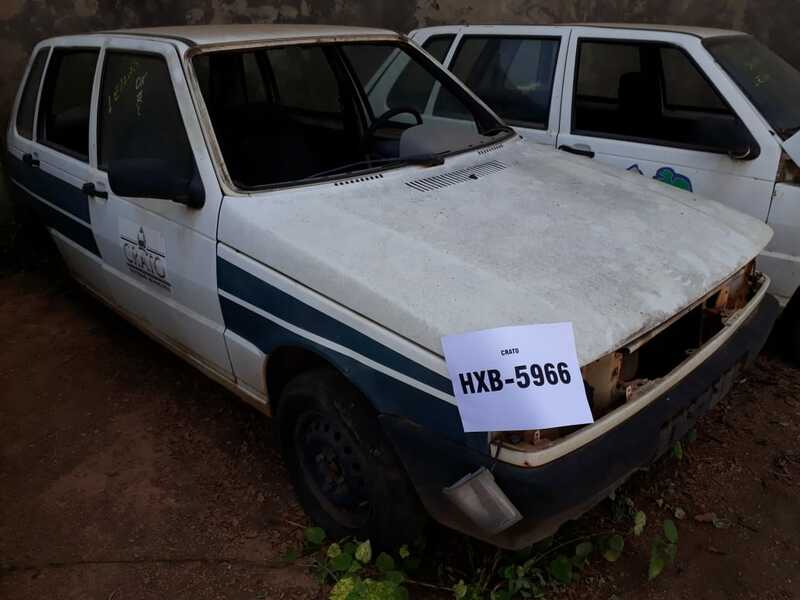 :- 1994- CHASSI N.º: 9BWZZZ23ZRP009232 - MOTOR N.º UG157194 - RENAVAM:- 618554297 . 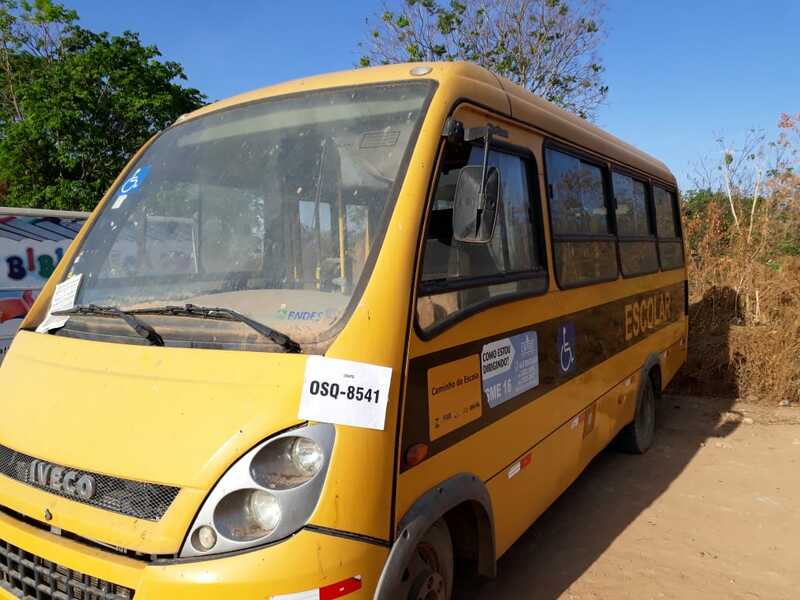 01 tipo: ONIBUS - MARCA: - MBMARCOPOLO VICINO ON - PLACAS:- HXL0618CE - COMB. :- D- COR:-BC - ANO FAB. :-2002 - ANO MOO. 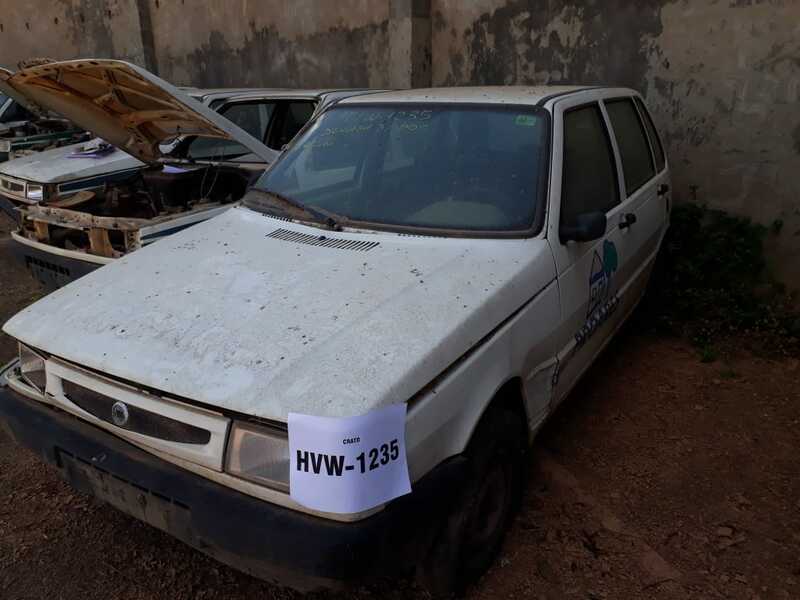 :- 2002- CHASSI N.º: 9BM6881562B306485 - MOTOR N.º 37498810533626 - RENAVAM:- 788694812 . 01 tipo: CAMINHÃO – MARCA: - GMCHEV. 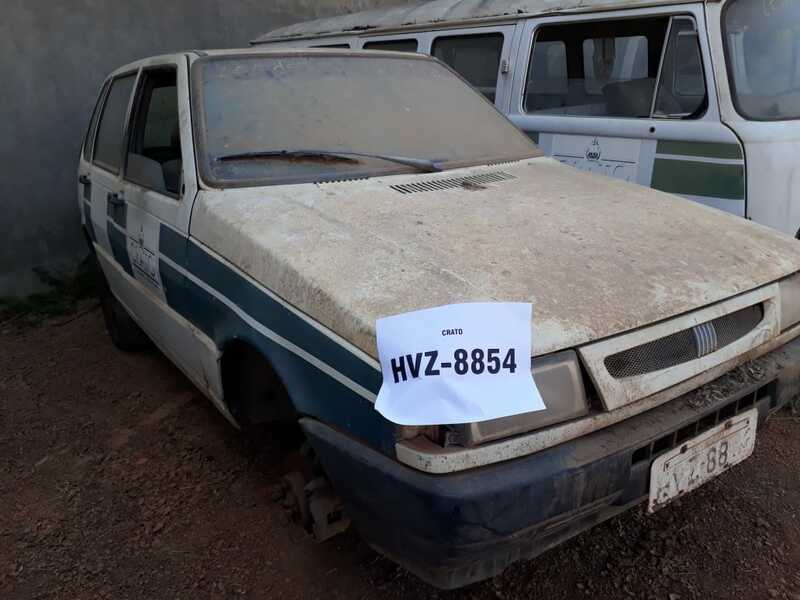 14.000 - PLACAS:- HUZ4297CE - COMB. :- D- COR:-BC - ANO FAB. :-1991 - ANO MOD. 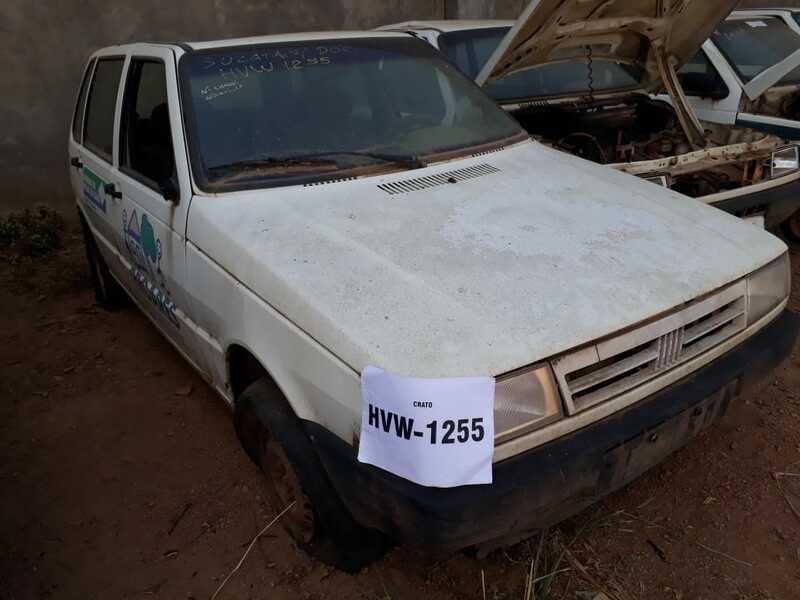 :- 1991- CHASSI N.º: 9BG783NWMMC027022 - MOTOR N.º TU8833B044204V - RENAVAM:- 162161794. 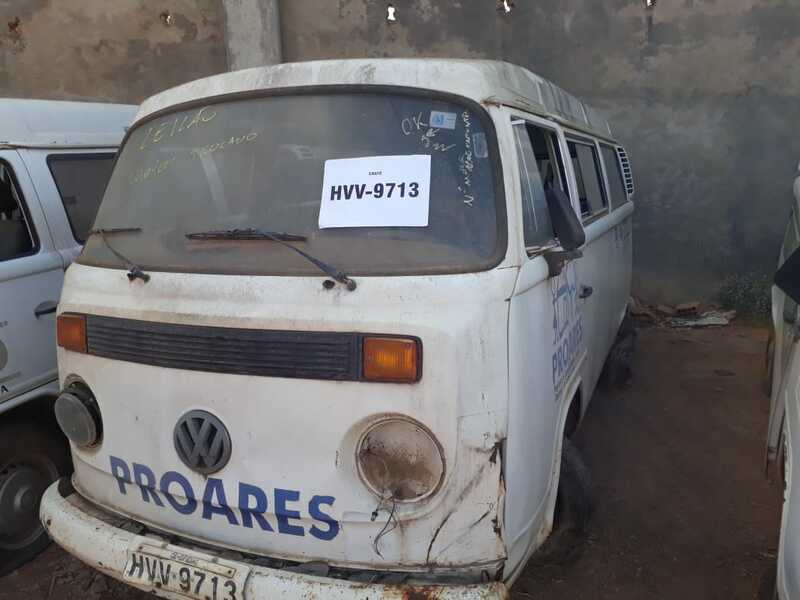 01 tipo: ONIBUS - MARCA: - VWMARCOPOLO FRATELLO - PLACAS:- HXV0301CE - COMB. :- D- COR:-BC - ANO FAB. :-2002 - ANO MOD. 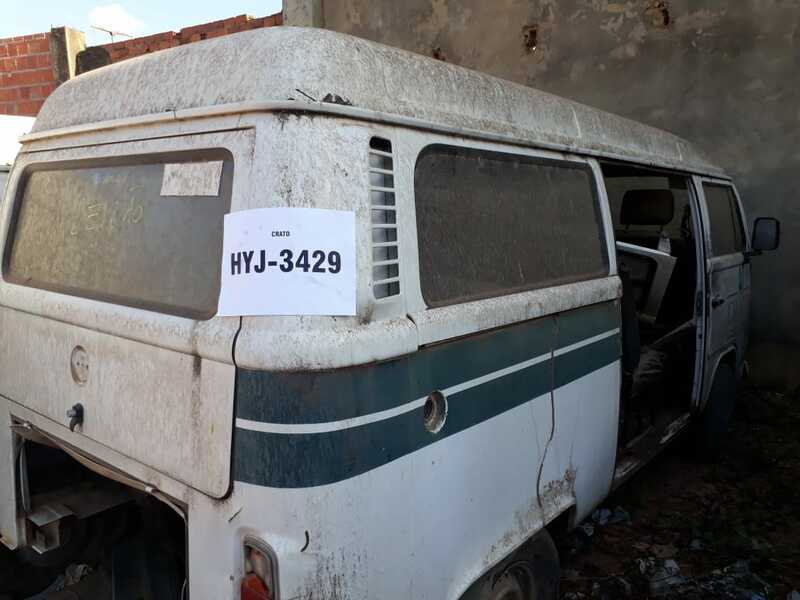 :- 2002- CHASSI N.º: 9BWFD52RX2R221049 - MOTOR N.º 4089834 - RENAVAM:- 797042180 . 01 tipo: ONIBUS -MARCA: -1/IVECOCITY CLASS 70C17 - PLACAS:-OSQ8541CE -COMB. :-D-COR:-AM -ANO FAB. :-2012 ANO MOD. :-2013-CHASSI N.°: 93ZL68C01D8446276 -MOTOR N.º F1CE34811 *7163934* -RENAVAM:-509575897. 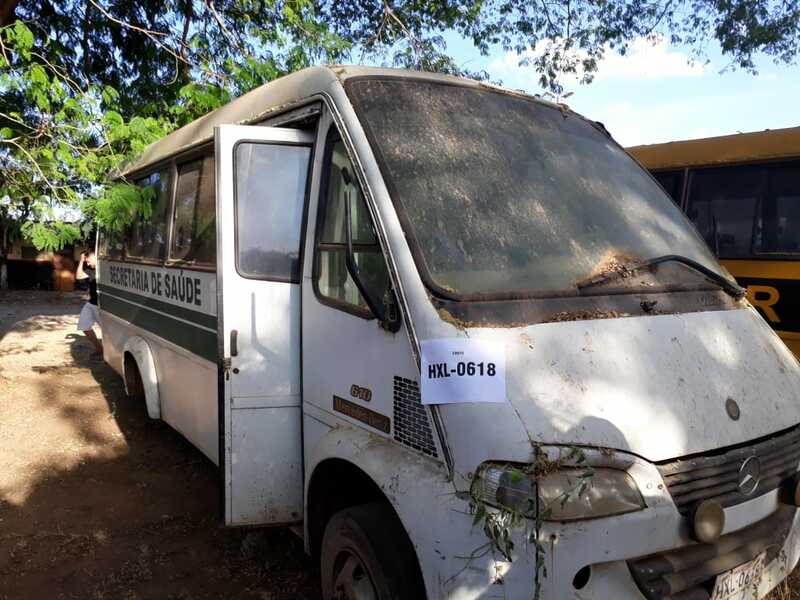 01 tipo: MICROONIBUS – MARCA: - MBANCAR PRINCIPALLE - PLACAS:- HXB6016CE - COMB. :- D- COR:-BC - ANO FAB. :-2003 - ANO MOD. 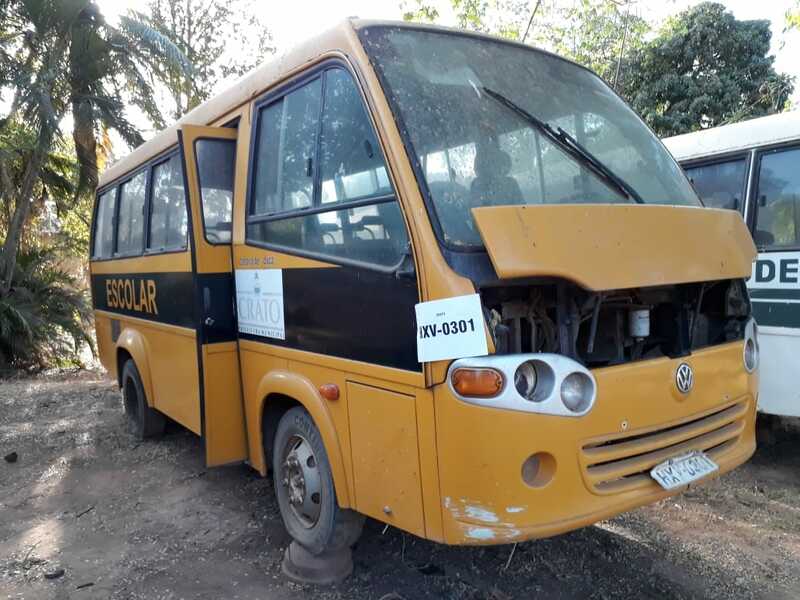 :- 2003- CHASSI N.º: 9BM6882763B327705 - MOTOR N.º 904924552575 - RENAVAM:- 809709112 . 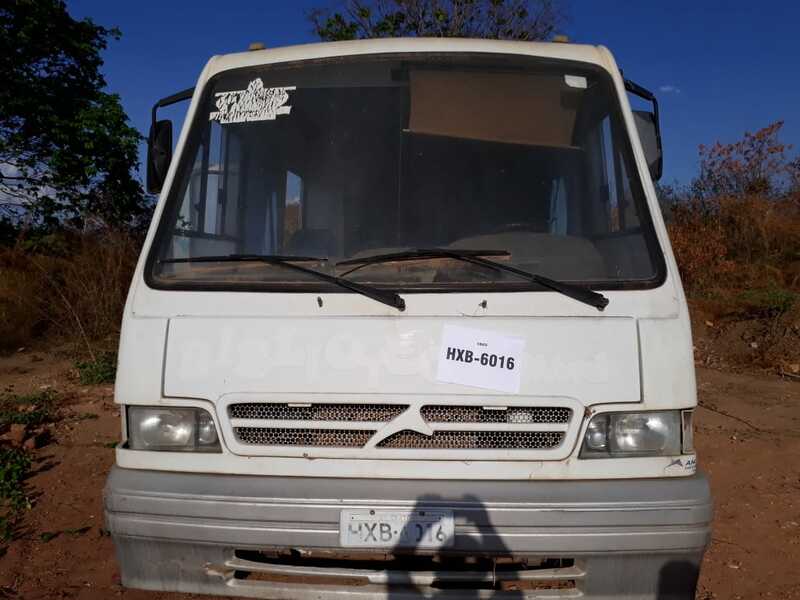 01 tipo: ONIBUS – MARCA: - MBOF 1113 - PLACAS:- KIM6970CE - COMB. :- D- COR:-AM - ANO FAB. :-1986 - ANO MOD. 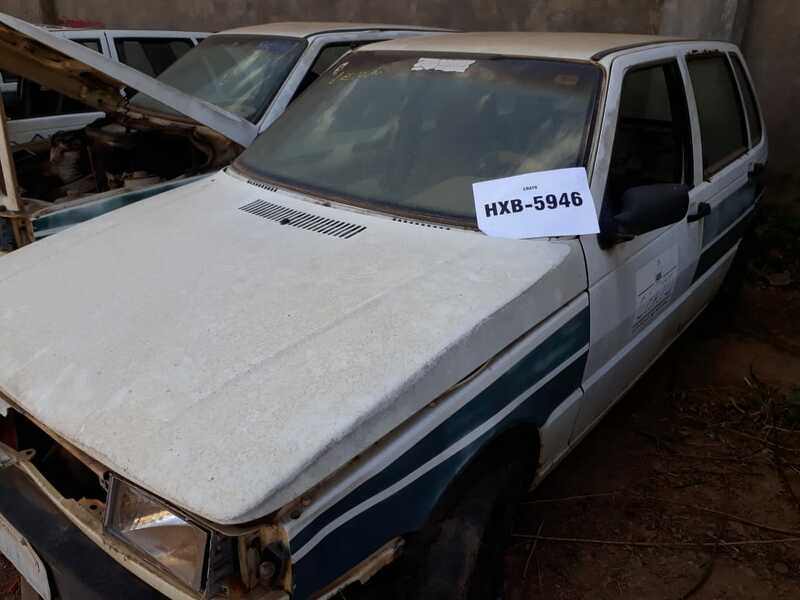 :- 1986- CHASSI N.º: 9BM344058GB710732 - MOTOR N.º 34494610 - RENAVAM:- 186023928 . 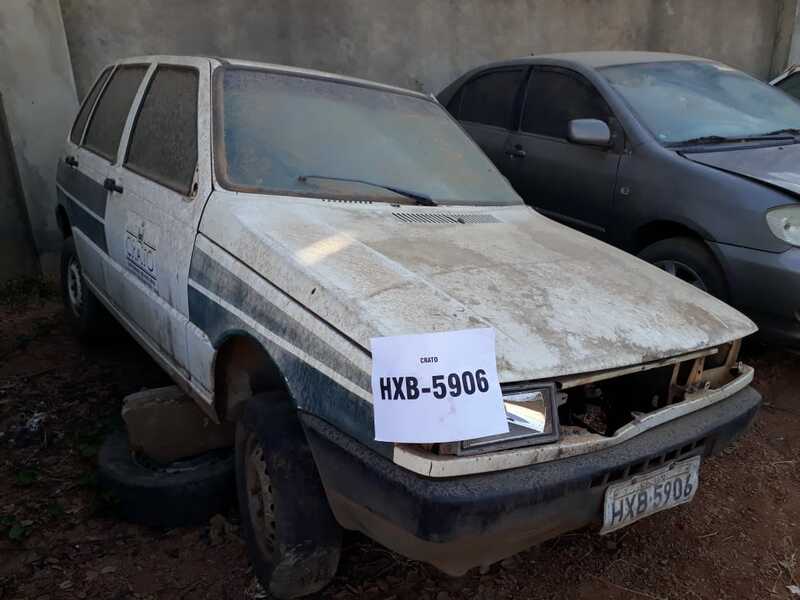 01 tipo: AUTOMOVEL – MARCA: - TOYOTA COROLLA XEI 18 VVT - PLACAS:- HXF0225CE - COMB. :- G- COR:-CZ - ANO FAB. :-2003 - ANO MOD. 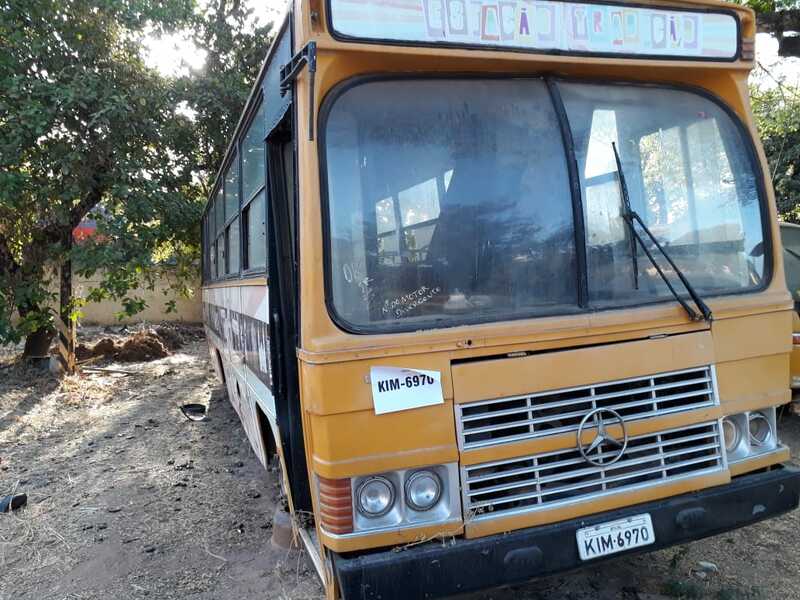 :- 2003- CHASSI N.º: 9BR53ZEC238522109 - MOTOR N.º Z30214777 - RENAVAM:- 805898603. 01 tipo: CAMIONETE – MARCA: - FIAT DOBLO GRRENCAR MO4 AMB. 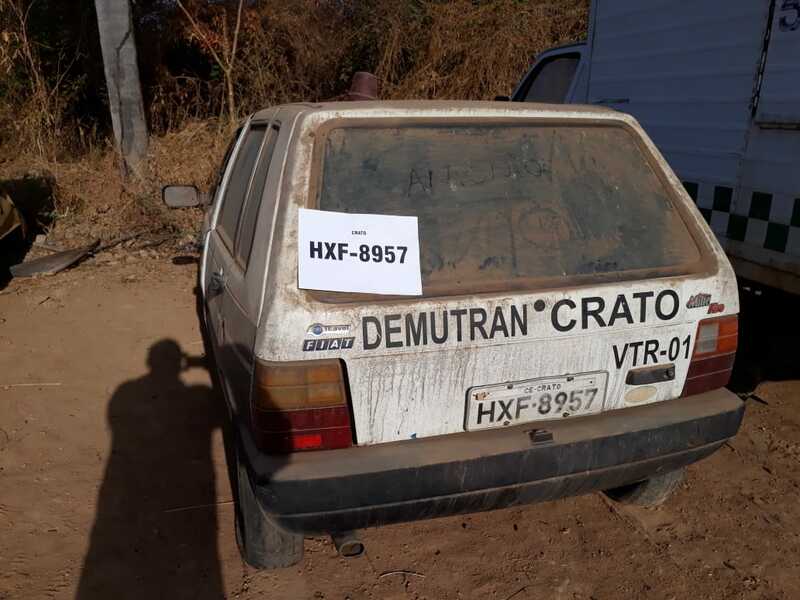 - PLACAS:- HXL6256CE - COMB. :- GA- COR:-BC - ANO FAB. :-2006 - ANO MOD. :- 2007- CHASSI N.º: 9BD22315572010266 - MOTOR N.º J4*0217660* - RENAVAM:- 894870483.